"We are creating the National Guard to limit the circulation of weapons in the country," he told the Russian people during his annual "direct line" national call-in show. What wasn't clear was whether Putin was referring to guns legally owned by law-abiding Russians or to the stockpiles of illegal weapons flowing throughout Russia, fueled by the numerous wars on its borders. Russia has a short history of private gun ownership — it was rare during the Soviet era — but the country's stillborn civil society has started to push for greater access to firearms. Despite the government's apparent willingness to make concessions, statistics still show that many gun-owning Russians prefer to skirt the bureaucracy and keep their unregistered guns off the radar — for one reason or another. If Putin indeed intends to use the National Guard to track down these weapons, it wouldn't be without precedent. "We have already seen a progressive tightening of the rules for citizens and private security firms alike," says Mark Galeotti, an expert in Russian security services and criminal affairs. "But even after attempts to clean up the registration of firearms, there are many illegal guns in circulation in Russia." 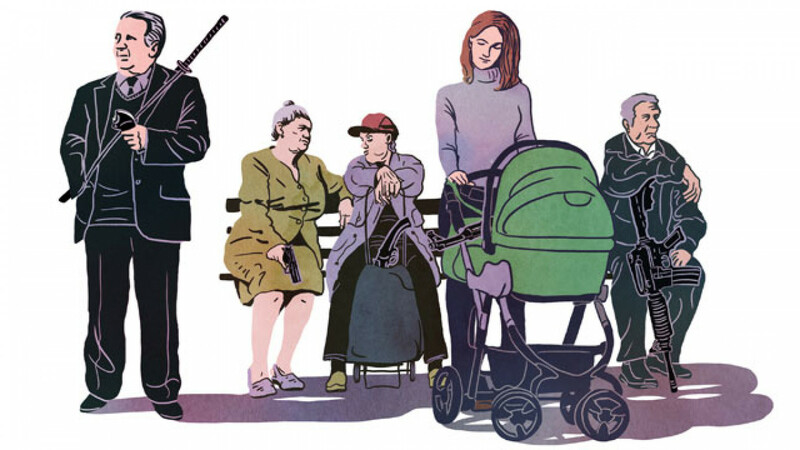 The types of illegal weapon used for the most serious crimes in Russia — contract killings, terrorism and similar types of activity — are often not unregistered shotguns, but military-issue firearms that Russian citizens don't have access to. "In other words," says Galeotti, "they are stolen from official stocks, essentially through corruption." You don't need to be a corrupt policeman or military officer to procure weapons in Russia. There are many other options, ranging from the physical black markets peppered around Moscow to more modern, darker sources. These are the markets based in far-flung corners of the Internet, absent from the usual indexing services like Google or Yandex. Maria Butina is the founder of Russia's first gun rights advocacy group. A tall, red-headed Siberian native in her late 20s, Butina called the group "The Right to Bear Arms," and it now boasts 10,000 members. While the government looks at ways of increasing public safety by reducing gun onwnership, Butina's movement argues the opposite is the only answer. When crime increases, they say, ordinary people should be armed. "We know a simple truth," says Butina. "More legal guns equal less crime. If a country bans guns, only criminals have access to them. We believe in evening the odds for the average Russian." Butina's group can claim moderate success in influencing government policy. Two years ago, they collected 100,000 signatures petitioning the government to pass the so-called castle doctrine law, legislation that grants citizens the right to defend themselves and their property from danger using lethal force. Putin's comments on the National Guard suggest that the Kremlin isn't as keen on the idea of armed citizens as Butina's group would hope. But she is now backed by the Russian gun industry, which — if the U.S. model is any indication — can be a powerful ally. Russia's gun industry, which is actively targeting civilian gun markets abroad, is also pushing for increased access to firearms within Russia. Ruslan Pukhov, the head of Russia's Association of Gunsmiths, is confident of progress. According to Pukhov, the clear trend for gun rights in Russia is toward liberalization. "It's two steps forward and one step back," he says. Butina is undeterred, saying the public "lacks proper understanding" of the role of guns in modern society. "Some people think guns have a will of their own; that guns kill people, rather than bad people killing people," she says. "Removing guns from criminals is all well and good, but the best 'National Guard' would be ordinary people with legal guns ready to defend the Motherland."